Happy Sunday to all my foodies out there! 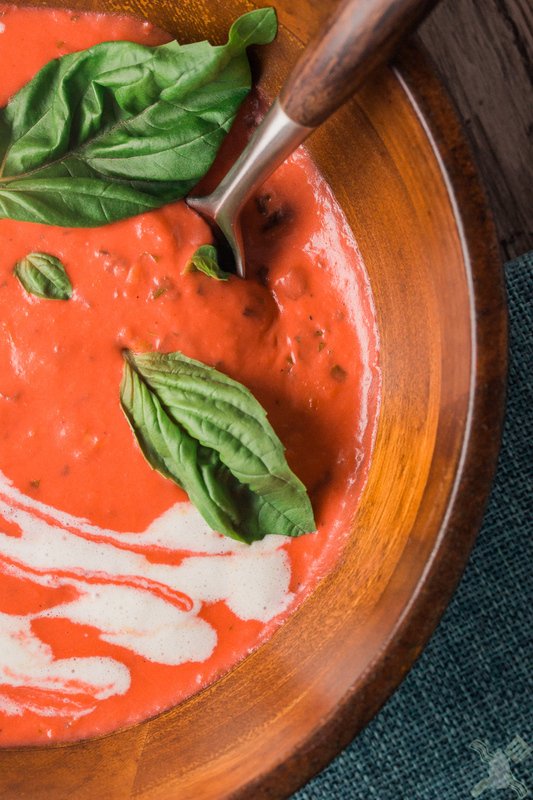 As promised, I have you a wonderfully creamy basil tomato soup recipe today, but first you must listen to me rant about parenthood, life, and well food. I wish life was only about food sometimes, food I can deal with and I know, everything else perplexes me. Braedon has been a pill this week, he has literally skipped all of his naps or if he does take them, it is for like 20 minutes maximum. The world is too interesting to him right now. I get it, but mommy needs a little break sometimes. A little silence. Having a baby is very hard when you’re used to being productive. Braedon did not want me to cook that night. The poor baby is crying. We got him a fenced play yard set up in the living room now, he loves it for like 30 minutes at a time and then he wants to go somewhere else. I have been taking him for more walks, hoping for it to help him sleep or something, but not always. At least I’m shedding some of those pregnancy pounds! But when he smiles, I just want to die. Baby smiles are the best. Before my photoshoot with Kettle and Fire, I headed to the Ferry Building. I met a friend there and spent way too much money. But I was able to get some amazing props for the shoot. I was also able to get some cheese, because cheese is life! Quick preview of the Kettle & Fire photography that I took on Sunday. I’ve had a busy week, a seriously busy week. Along with Braedon not wanting to sleep. I have met up with another blogger, met with someone about photographing her food for her new cookbook, had a 4.5 hour photoshoot, that turned out great. The night before the photoshoot, I spent about 3 hours making a Paleo butternut squash soup for the shoot. I gave it to a friend and she said it was good! And now, on Sunday, I am blogging. Let me expand that for you guys, I am blogging, with a baby on my lap, while editing photos and reading about SEO. I think I’m winning at this whole mom thing. Oh and it’s only 6:42pm, which means, I am not writing this at 11pm, which is so abnormal for me! I have dinner in the oven, the guy is cleaning his heart away, and I’m relaxing in the San Francisco sun that I missed all winter. Even though it’s not winter anymore, it’s still really chilly out. I still have soups regularly scheduled on my meal plan until at least mid-may. I decided to tweak my tomato soup recipe last week, I made it creamier, richer, more flavorful. This is something that you want to take home to your momma, or make you want to slap yo mama, which ever one really works for you… I’m not judging your relationship with your momma. Slap yo mama tomato soup! I love making cajun food and one of the first steps to cajun is a roux, so I made a roux before the soup. Let me tell you, this added something special to the soup. It made it thick and hearty. You need to make this before it gets hot out again. I’ll stop stalling, here is the wonderful recipe! Tomato Soup Recipe that is so good my 7 month old ate it! Use an immersion blender to blend the mixture- if you don't have an immersion, you can use a regular blender, just be very careful with hot liquids. We ate all of this, so I didn't even have time to store it. But you can freeze it for up to 2 months and have it in the fridge for 72 hours. I served it with this crusty herbed bread that I made the other day. Even the baby ate a bowl of it!